Luigi L. Pasinetti, Sraffa’s Circular Process and the Concept of Vertical Integration. 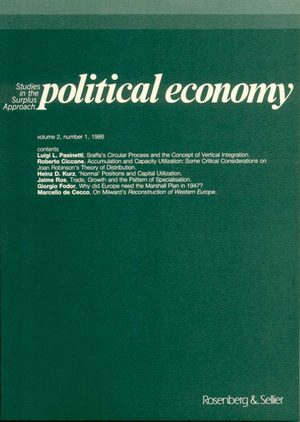 Roberto Ciccone, Accumulation and Capacity Utilization: Some Critical Considerations on Joan Robinson’s Theory of Distribution. Heinz D. Kurz, ‘Normal’ Positions and Capacity Utilization. Jaime Ros, Trade, Growth and the Pattern of Specialization. Giorgio Fodor, Why did Europe need the Marshall Plan in 1947? Marcello de Cecco, On Milward’s Reconstruction of Western Europe.